The group of phytonutrients includes many types of compounds, some more well studied than others. Carotenoids, which include beta-carotene, lutein and lycopene, comprise the group of compounds commonly found in red and orange pigments of fruits and vegetables. Other common phytonutrients include flavonoids found in citrus fruits, tea and wine and isoflavones found in soybeans. Phytonutrients exhibit biological activity in the human body and may provide protection against certain types of illnesses. Another group of compounds called xanthones naturally occur in a variety of plants and may be responsible for the medicinal potential of the plant. Scientists extracted two biologically active xanthone compounds from a plant found in the Madagascar rain forest known scientifically as Psorospermum cf. molluscum, according to research published in the “Journal of Natural Products.” In this study, xanthone compounds showed promise as being effective in killing tumor cells and helping repair DNA. Because this plant is not a food source, however, the xanthone compound must be isolated from the roots and wood stems. Tropical plants that belong to the group known as Garcinia also contain xanthones. Scientists have studied the extracts of the Garcinia hanburyi plant for its ability to suppress growth by inducing apoptosis, or cell death, according to research published in the "World Journal of Gastroenterology.” Although this plant is not edible, a tropical tree known as Garcinia mangostana produces a fruit used as a food source. Garcinia mangostana produces the mangosteen fruit, crowned the queen of fruits by the people in its native land of Thailand. The people of Southeast Asia use the mangosteen for medicinal purposes; to treat diarrhea, ulcers and inflammation; and to heal wounds. 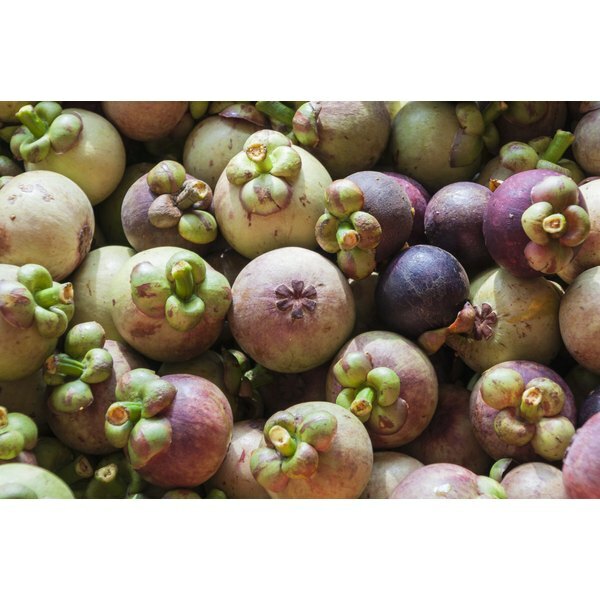 More recently, since scientists discovered that the mangosteen fruit, including the juice, pulp and rind or pericarp, is a rich source of xanthones. It has become one of the three top-selling botanicals in the United States since 2007, according to information published in the “Mini Review of Organic Chemistry.” Supplements and juices made from the mangosteen fruit have not been proved to improve health, but research on mangosteen and xanthones shows that this food product may provide health benefits.